Are You Eating Sugar Alcohol? What is sugar alcohol? Is it healthy? Here's a quick primer. During one of the Mid-Autumn Festival of yesteryear, I discovered the newly innovated sugarless mooncake, a delectable traditional Chinese cake filled with lotus paste which was supposed to be loaded with a colossal amount of sucrose content. Maltitol was used as a sweetener. Later I was to learn that this chemical sounding name is a sugar alcohol, just like other common artificial sweeteners such as as Xylitol, Sorbitol and the lesser known Mannitol, Erythritol, Isomalt, Lactitol, Hydrogenated starch hydrolysates (HSH) and Glycerol, mostly sharing the same easily identifiable suffix "itol". Sugar alcohol is a misnomer. Taking it will not intoxicate you; it is not an alcohol, though technically, they are hydrogenated carbohydrates and share some of the structural properties of alcohols at the molecular level. And neither is it a sugar even though it does taste just like sugar and sweeten your food. It belongs to a class of sugar substitutes called polyols that have found their way into a myriad of low-calorie, low-fat, and sugar-free processed foods, and are an appealing choice among diabetics looking for sweet alternatives including sucrose-free chocolate, soft-drinks, chewing gums, biscuits and candies. Due to its low glycemic index, it is slow to be absorbed by the body and does not cause a dramatic sugar rush or blood sugar spike like normal carbohydrates do. Sugar alcohol behaves like a fibre, it passes through our system without loading you with the carbs. Sugar alcohols are also used as a bulking agent in cooking and baking; they add texture to foods, retain moisture and prevent foods from browning under heat. Sugar alcohols are extracted and processed from various food sources. For instance, Mannitol is extracted from seaweed, Sorbitol is manufactured from corn syrup, and Hydrogenated starch hydrolysates are produced by the partial hydrolysis of corn. While sugar alcohol may sound like a healthier choice for those in quest for low caloric sweeteners, like many other artificial sweeteners it is associated with some negatives. Its unpleasant side-effects include its laxative effects. Due to the lack of digestibility, when consumed at high levels, it lingers in the intestines for a long time and can cause bloating, flatulence and gastric discomfort. For those who are making an effort to use more unprocessed, raw alternatives and less of the excessively heated and processed, sugar alcohols should be kept out of their diet plan. 2. There is nothing healthy about sugar-free candies: Would You Still Eat Sugarfree Candies? 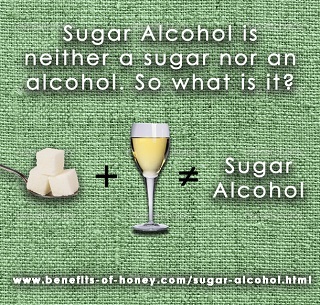 End of "Are You Eating Sugar Alcohol?" Back to "Sugar Substitute: What's behind each name?"